Brainwashed - Six Organs of Admittance, "Burning The Threshold"
Six Organs of Admittance, "Burning The Threshold"
Ben Chasny’s latest release takes a quietly melodic detour from the more challenging fare unleashed by his recent hexadic composing experiments, a gentle path that seems to have been willfully chosen as a modest counterbalance to the pervading darkness of the last year. I have some mixed feelings about that plan, as championing love and forgiveness sounds just fine to me, but Chasny occasionally errs a bit too much on the side of mellow, bucolic '60s/'70s folk rock for my taste. If that side had always been the Six Organs aesthetic, it is doubtful that I ever would have become a fan, as I am most drawn to Chasny's psych side, as well as his unconventional guitar heroics. 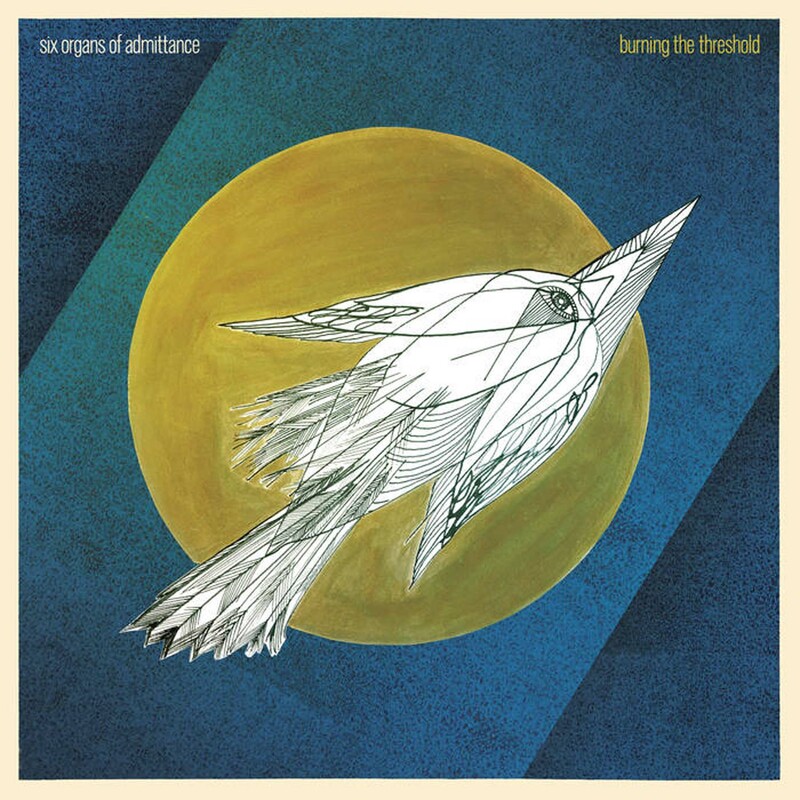 As a one-off event, however, Burning The Threshold is quite a pleasant and disarming sincere album, offsetting occasional shades of classic Six Organs with a generous supply of surprisingly accessible hooks and melodies (as well as a bevy of talented guests). The opening "Things as They Are" is a near-perfect statement of intent for the entire album, feeling like a simple, intimate, and pure acoustic guitar piece that could be lazily strummed around a campfire. While its straightforward structure and major chords are not particularly novel on their own, Chasny's virtuosity and cerebral/lysergic eccentricity still creep in to make it an unusual and satisfying piece. I especially enjoyed the lovely central guitar melody, but I was also struck by how the seemingly saccharine chorus of "angels are necessary" expanded into something a bit more poetic and evocative. It is also one of the punchier pieces on the album, maintaining a pleasantly rolling momentum and ending at exactly the right time. While the radiant, beatific sentiments of that opener continue to resonate throughout the rest of the album, Chasny covers a relatively wide swath of stylistic territory and tone over the course of Threshold's nine pieces. In fact, it kind of feels like he is channeling all of his favorite private press obscurities and acid-folk visionaries into a single kaleidoscopic song suite. Not all of those strains are quite for me, sadly, as Chasny has a far greater love of mellow grooves and falsetto choruses than I do. The mantric Damon and Naomi-featuring "Under Fixed Stars" is likable enough, I suppose, but the album’s half-sleepy/half-anthemic single ("Adoration Song") is my least favorite song on the entire album by a landslide. Unexpectedly, however, the instrumental that follows ("Reservoir") is an achingly beautiful masterpiece of tumbling melodies, dual-guitar harmonies, and vibrant cascades of pull-offs. That dichotomy is the essential caveat with Burning The Threshold: I never know which Ben Chasny I am going to get. I like some of them a lot, but certainly not all of them. Chasny is joined by Ryley Walker on "Around The Axis," which is yet another strong instrumental, resembling a negative image of "Reservoir" that rolls and churns with a dark intensity as layers of melodies and arpeggios beautifully intertwine and harmonize. The following "Taken By Ascent" is another gem, as a bluesy, rhythmic riff erupts into a propulsive groove when Chris Corsano's drums unexpectedly kick in and Chasny stomps his distortion pedal. The underused Corsano also appears in comparatively muted form on the aforementioned "Adoration Song," but "Taken By Ascent" offers an enticing glimpse of a better album that could have been, as the heavy groove and wild fills give the proceedings an extremely welcome and visceral infusion of passion and life. Accordingly, "Ascent" is kind of all-star jam, as Haley Fohr joins in for the choruses and Bitchin’ Bajas' Cooper Crain contributes a very "psych" free-form keyboard solo over the outro. "Threshold of Light" is similarly enjoyable, as it is built on a wonderful descending dual-guitar hook and sounds half like an occult invocation and half like a particularly inventive acoustic reworking of an Iron Maiden song. Chasny and his collaborators hit the mark yet again with the bright and lively instrumental "St. Eustace," which unexpectedly breaks into a middle section of prog-like intricacy and complexity. At his best, Chasny is truly in a class by himself, unleashing wonderfully melodic hooks embellished by a host of flourishes and layers of great harmonies and countermelodies. I wish he harnessed that firepower more often on this album, but he has still a fairly impressive hit-to-miss rate and no one else can do what he does at all. Also, the final piece ("Reflection") shows that his more understated and languorous side cannot be completely dismissed, as Chasny sheds all of his collaborators and manages to hit the perfect balance of space, motion, melody, and looseness all by himself. While I am not particularly fond of a couple songs, my only significant critique of Burning The Threshold is that Chasny makes some seemingly self-sabotaging decisions and tonal shifts that I find quite perplexing. On pieces like "Reservoir," I feel like Six Organs of Admittance is one of the greatest and most underappreciated bands in the American underground, yet the "rise up now" chorus of "Adoration Song" is my least favorite passage on the entire album and that was chosen as the lead single. Admittedly, me liking something is certainly a commercial kiss of death, but Chasny is not a traditional pop or rock artist, so I think my instincts are sound here. It is rare for me to encounter an artist where I truly have no idea where they are creatively coming from or what motivates them, yet Chasny is exactly such a fellow. I am sure it probably just rooted in something like a deep teenage love for The Grateful Dead or something. Regardless, Six Organs is a project that leaves me in a state of permanent uncertainty about what Chasny will do next and whether or not I will like it. On some level, I suppose that is great, as I keep buying Six Organs of Admittance albums and never find myself thinking "Ok, I get what this guy is going for–I don't need to hear any more." The downside, of course, is that I find Chasny's oeuvre and this album uneven at times, but I would much rather an artist take chances and evolve than languish in stasis. Ben Chasny is no languisher and Burning The Threshold is mostly a very good album that compensates for its occasional missteps with somewhat more frequent flashes of brilliance.